Thank you so much. I thought I lost them forever. Came out great. I'm so happy. I would take them to a jeweler and have them clean and polish them. Having your rings professionally cleaned sounds good but it could be costly with that many rings. 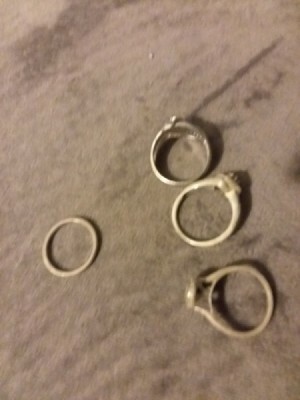 Your rings have oxidized but can still be cleaned. You might try the aluminum foil method. There are some very good silver cleaning products available at big box stores or on-line (Amazon) and these usually work well. Here is an example from Walmart but it is sold in their stores also. Plain white toothpaste may help. Just a basic one, not with whitening power or any of that...like a plain original Colgate or even a plain generic brand. When I used to have a set of sterling silverware, I had one that was accidentally left in the sink overnight with dish soap (it fell into a soaking pan of yuck) when I found it it was all discolored and awful looking. Polishing it with plain old white toothpaste on a white cloth got it back. It took a few times of rubbing, but it worked. For all of my jewelry, I use a small amount of toothpaste and a soft bristled toothbrush to clean them. They come out sparkling and shining just like new. That has happened to me. i clean my dishes with a little bleach, and the bleach turned by silver rings grayish-white. I cleaned the rings with mild liquid dish detergent and water. then I used a tiny bit of toothpaste. Rub the toothpaste in with a soft cloth under and top of the ring. Rinsed it off, then puff the ring. IT'S GOOD AS NEW.